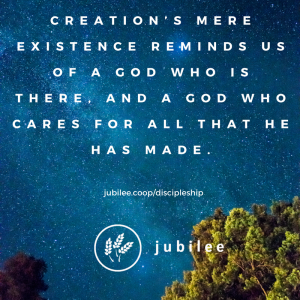 That creation care is part of the mission of the Church is widely accepted. But is creation also relevant to the other marks of mission? 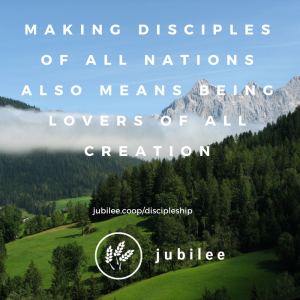 In the second of a four part series, jubilee’s Matt Williams and Jonny Hanson look at discipleship. Although all Christians must be prepared to witness, ‘proclamation’ is not everyone’s main calling. All, however, are called to discipleship, as the basic category of Christianity, and making disciples is also a core aspect of mission (Matthew 28:16-20). Discipleship involves obeying all that Jesus taught, starting with genuine knowledge of God. This knowledge of God shapes all that we do, as the Bible everywhere emphasizes. But where is Jesus’ teaching on environmental care? It’s not explicit – the pre-industrial global population of 300 million of his time lived well within the carrying capacity of the planet. However, there’s still plenty under the surface of the Gospels relating to creation. The first thing is loving our neighbours as ourselves (Mark 12:30-31). Given that we have seven billion neighbours (and counting) on one small planet, it’s clear that we can’t accomplish this mandate without caring for the creation that sustains us all: rich and poor, young and old, alike. We see this increasingly with climate change, where the West’s historic and current overuse of fossil fuels is driving extreme weather patterns that hurt the most vulnerable communities on the planet the hardest. 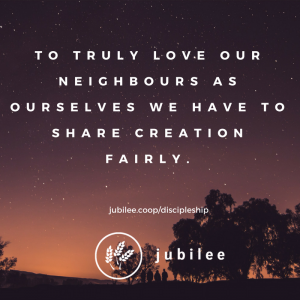 To truly love our neighbours as ourselves we also have to share creation fairly, something that we’ll explore more in the fourth article in this series. Jesus’ prioritising of ‘love your neighbour’ was not new teaching. It was rooted in Judaism and ultimately in the Hebrew Bible (our Old Testament). Debate continues over how exactly Christian discipleship relates to the 39 books before Matthew, but none argue that the basic mandate governing human life has been erased (eg. Matthew 19:1-9). The application of this is a bone of contention in the current conflict over the Bible and sexuality but it is equally important for care of creation. 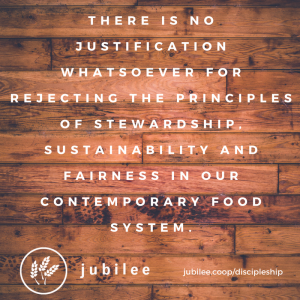 We cannot enforce the agricultural law of Leviticus, for example, but there is no justification whatsoever for rejecting its principles of stewardship, sustainability and fairness in our contemporary food system. Another key aspect of Jesus’ teaching and example is that disciples must live by God’s Word. Put simply, we must not do something because it is immediately accessible or feels good, but because we know it is right. This is especially relevant to Western Christians; we know that we should care for creation, and we know that people suffer when we abuse it. Yet it feels more convenient to have all the comfort of easy food, easy travel, and the technology that makes our wish its command. But isn’t this life by the flesh rather than the Spirit (Romans 8:1-6)? Discipleship means becoming more and more like Jesus Christ. Becoming more and more like Jesus Christ means engaging with the world around us through the medium of his birth, life, death, resurrection and return. In terms of how we relate to the rest of creation, this means loving our neighbours as ourselves; reaffirming the equity and stewardship ethics of the Old Testament; living by God’s Word; and wondering at God’s world. Making disciples of all nations also means being lovers of all creation. This article was first published in the October – December 2017 issue of Vox.